This omnibus of the acclaimed Vows and Honor trilogy, set in the New York Times bestselling world of Valdemar, follows Tarma and Kethry, swordswoman and sorceress, as they seek justice for past wrongs. 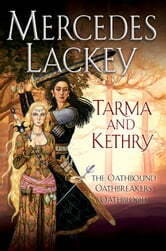 The Oathbound: Introduces Tarma--swordswoman trained by elite warriors in all forms of deadly combat--and Kethry, former noblewoman whose magical skills were shaped by a powerful school of sorcery. United by the Goddess and armed with a magical sword drawing them to those in need, Tarma and Kethry swore a blood oath to fight against evil. Oathbreakers: When Idra, leader of the Sunhawk mercenaries, failed to return from a journey to her home kingdom of Rethwellan, Tarma and Kethry set out in search of her. Instead they find a land shadowed by a dark enchantment, the claim to the throne in question, and the people of Rethwellan in terrible jeopardy. Oathblood: The sisters of sword and spell have pledged to train others to fight for their cause, starting a school for fledgling warriors and mages. But training turns out to be far more perilous than expected--and when two of their students are kidnapped, Tarma and Kethry must draw upon their combined skills to answer the call of destiny in ways they never imagined.